Winter time fishing is slowly coming to an end and I am looking forward to the warmer weather fishing of spring. The lake surface water temperature is rising slowly which will help make all species more active. 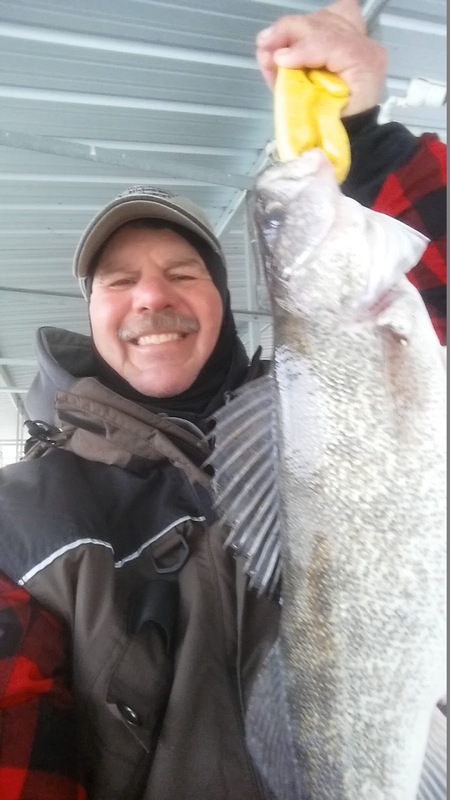 At this time bass fishing has been good and walleye fishing is starting to pick up. 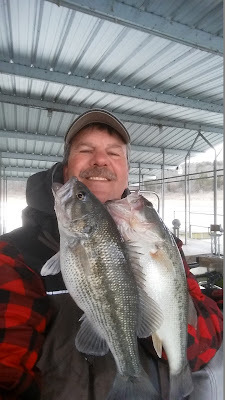 I have been catching some nice sized spotted bass and largemouth bass with many shorts among the keeper sized fish. Yesterday morning I tried out a tube jig, working it in about 25 - 30 feet of water with good success. The slower I worked the bait along the bottom the better. I have also been picking up some nice fish vertical jigging a spoon in 30 - 45 feet of water. Brush piles are also holding some nice fish. Walleye are starting their spawning run. Some of the fish are staging out in 20 - 30 feet of water and others are heading into shallower water. Gravel banks will be some of the best areas to find these spawning fish. One of the well known spots to fish for walleye is up river in the Calamity area and farther north into Missouri. Berkley's Flicker Shad and Smithwick's Rogues are a couple of good baits to cast out for those shallow spawning fish. For the deeper walleye drag a crawler harness or a live shiner on the bottom at a very slow speed. Remember with live bait you may need to feed line out once you get a strike to let the walleye take the whole bait into it mouth. Other areas that will be holding walleye are back in the major creeks. Also look for those gravel banks. The last several mornings (not including today) I was out looking for striped bass in the Cranfield area. I am finally marking a few big fish following bait balls, but every time I find a few fish I am graphing and not fishing. When I start to fish I lose site of them. The good sign is that I am starting to mark bait balls suspended down 20 - 40 feet in 50 - 60 feet of water. As the water warms the larger bait will continue coming off the bottom and the fish will follow. What I have found in the bait balls is white bass. This is telling me the whites are starting to move towards their spawning areas. It will not be long before the Bennetts and Calamity areas will be filled with spawning whites. Hummingbird Hideaway Resort's 4th annual fishing derby commences on March 1st. Last year produced some really nice fish and the winners won nice monetary prizes for the longest striped bass, crappie and large/smallmouth bass. All of our guests can enter for a chance to win the longest fish categories, as well as, a drawing for a free week stay. The Norfork Lake level is currently starting to rise with the current rains we are having and sits at 545.56. If we get the rain that is forecast I can see a substantial rise in the lake level over the next couple of days. Norfork Lake is currently 8 feet below normal pool. The surface water temperature is also on the rise and currently is in the mid 40's. The main lake is clearing as well as the creeks and coves. The lake is still not as clear as it typically is this time of year. 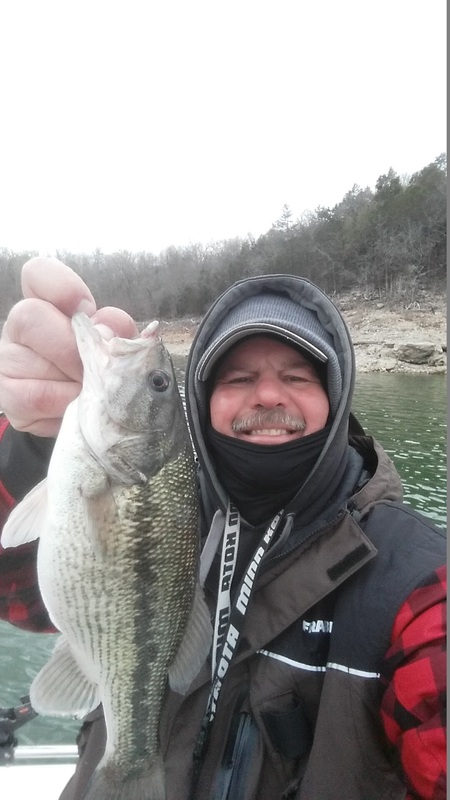 Norfork Lake is shaping up to be in great condition for spring fishing. Happy fishing a see you on the lake.